The luxury saloon segment may be shrinking, but some manufacturers still believe that there are customers who prefer the sophistication and refinement of a full-sized saloon over a bulky SUV. We do a specification comparison of the best three options available in this space. After being absent from the Indian market for almost three years, the Volkswagen Passat is finally back. However, in the time gap between discontinuation of the old model and introduction of the new one, the luxury saloon market has changed, or better said, shrunk. In fact, the D+ segment now only includes four saloons - Skoda Superb, Toyota Camry, Honda Accord, and the newly launched Passat. The Accord is best kept away from this comparison as it is only available as a hybrid - and thus priced exorbitantly. 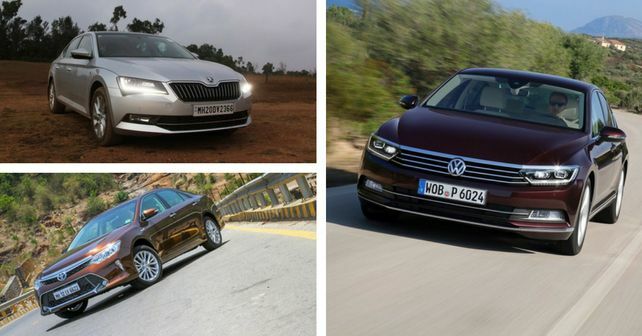 So let’s figure out how the new VW Passat compares to Skoda Superb and Toyota Camry spec-wise. Both the Passat and Superb share a lot of components under the skin, as these cars are based on the Volkswagen Group’s MQB modular architecture. However, physically, the Superb is slightly longer, wider and taller than the Passat. The Toyota Camry, too is longer than the Passat, but narrower in comparison to the Superb. The Skoda Superb, in fact, has the biggest dimensions of this lot - and the most spacious boot as well. To avoid overlapping with Skoda Superb within the Volkswagen Group, the VW Passat has been positioned as a slightly premium alternative to the former. And so, both variants of the Passat come very well equipped. The cabin of the new Passat is made of top notch materials, with the design of the dashboard reflecting that of the more expensive Audis. The Superb remains the most spacious car in the group, with rear seat legroom rivalling some luxury limos. The cabin of the Superb features the typical Skoda design philosophy, which may not look as special as the new Passat’s, but is very well build nonetheless. While the Camry cannot quite match the solid build quality or the design flair of the Europeans, it remains a comfortable car in its own right. The rear legroom on the Camry is pretty good, and the seats are big and supportive. A big advantage in the Camry is the absence of the transmission tunnel hump, making it easier to accommodate three passengers at the rear. This is where the three cars differ quite a bit. The Skoda Superb is the only car here that provides the most flexible traditional engine and transmission combinations. There is a petrol manual, a petrol automatic, and a diesel automatic as well. The VW, in comparison, can be only had with a diesel automatic powertrain option. The Toyota Camry, can be had as a petrol automatic, or, as a hybrid. The component sharing between the Passat and Superb extends here as well, where the two cars share a common diesel engine and gearbox combo. The engine in question here is VW’s ever so popular 2.0-litre TDI mated to a 6-speed dual clutch automatic gearbox. The Skoda, additionally, also gets VW’s critically acclaimed 1.8 TSI turbo petrol engine, mated to either a 6-speed manual, or a 7-speed DSG. Coming to the Toyota, the car uses a 2.5-litre engine in its petrol avatar, while the hybrid gets a lower-spec version of the same engine combined with an electric motor. Both set-ups come mated to a continuously variable transmission. Starting under Rs. 24 lakh, the Skoda Superb provides the most bang for your buck. The Passat has the highest starting price of this lot, thanks to the fact that it does not offer a petrol engine. Compared to Skoda, the Camry, too, looks like it is priced on the higher side. The hybrid variant of the Toyota, after GST implementation, has witnessed a surge in its pricing.